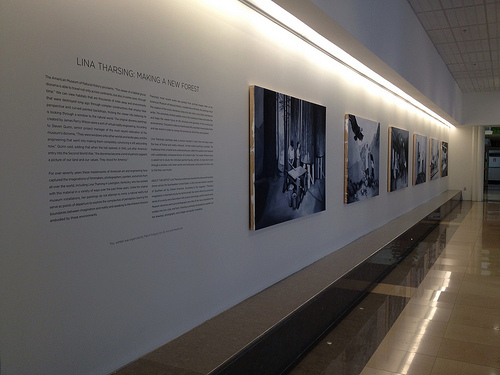 Lina Tharsing "Making a New Forest Exhibit" at UK Hospital - Lexington, Ky. The work of Kentucky artist Lina Tharsing is "driven by a profound sense of curiosity and a fascination with science, technology, and the natural world." Her recent works, as found in the exhibit at the Chandler Medical Center, contain filmstrip-colored imagery inspired from the archives of New York's Museum of Natural History. The museum itself contains an amazing collection of dioramas portraying themselves wildlife in natural habitats. Many of these old dioramas can seem dated to museum-goers today, whose appreciation is for fast action. Though Tharsing does nothing to 'speed up' the dioramas, her unique interpretation of their creation itself resonates. 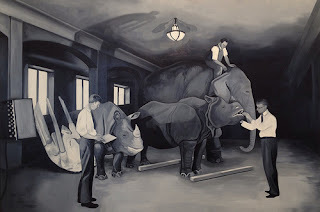 The paintings are described as seeking "a precise moment in both time and space when the lines of fiction and reality intersect." 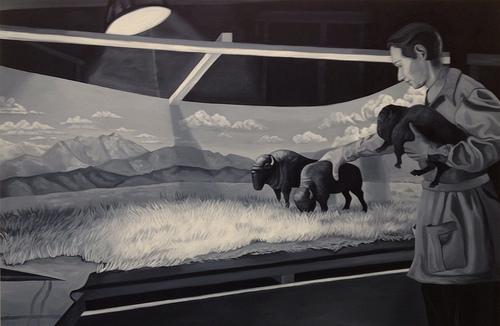 The fiction is the creation: there is no bison under the dioramist's arm as he carefully places his herd. But to those who have constructed a school display or a volcano for a science fair, there is a connection to the real world. And yet, there is a connection to the divine as God found his creation "good" in Genesis. So, too, these dioramists and artists found their creation good. For decades, they have withstood time at the iconic New York institution. By bridging the gap of reality and fiction, Tharsing is able to succeed where many artists fail. She creates a body of work where the call on the exhibit showcard can be achieved: "to study not the individual painted figures, animals, or props but to look through a window onto other worlds and landscapes, across place and time, and to find their own truths." Find your own truth in Tharsing's "Making a New Forest." It is presented by UK Arts in Healthcare and the art can be seen in the East Gallery of the UK Albert B. Chandler Medical Center. An opening reception will be held Friday, April 27 from 6-8 p.m. with details being available and reservations made on Facebook.